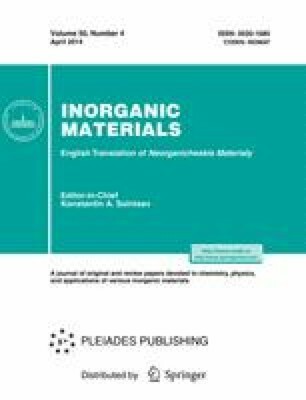 We have studied the formation of thin textured LiNbO3 films in originally amorphous samples produced by rf magnetron sputtering of a single-crystal target on silicon substrates containing a native oxide layer. The results demonstrate that postgrowth annealing leads to the formation of two phases, LiNbO3 and LiNb3O8, and that the percentage of the nonferroelectric phase LiNb3O8 is minimal after annealing at a temperature of 700°C. Annealing at 700°C is optimal because it ensures the lowest surface roughness of the film, the highest degree of structuring of the ferroelectric phase, and the maximum contrasts corresponding to the vertical and lateral components of the ferroelectric polarization in piezoresponse force microscopy. Original Russian Text © D.A. Kiselev, R.N. Zhukov, A.S. Bykov, M.I. Voronova, K.D. Shcherbachev, M.D. Malinkovich, Yu.N. Parkhomenko, 2014, published in Neorganicheskie Materialy, 2014, Vol. 50, No. 4, pp. 453–456.